When you see the number “666” on the tail number of a plane, it is entirely understandable if you opt to stay on the ground. That number is as superstitious as a black cat walking under a ladder and given the reputation of this particular plane for returning to base shot to pieces; it becomes impossible to distinguish fact from superstition. But that didn’t stop an insubordinate and audacious crew from taking a chance on her. And that strategic bet at the cost of much blood and steel would earn two of its crew the Medal of Honor and the rest the Distinguished Service Cross. This is the tale of the most heavily armed B-17 of the Pacific Theatre who took on 17 Japanese fighters alone and limped home victorious. Previously known as “Lucy”, a name the heralded crew would never embrace, the 666 was known as a cursed bomber. The B-17 didn’t look all the different from the rest, but it had a remarkable ability for returning back to base all shot up to pieces. As a result, no crew wanted to fly her and it was towed to the end of an airfield in the Pacific where it was expected to be cannibalized for scraps. 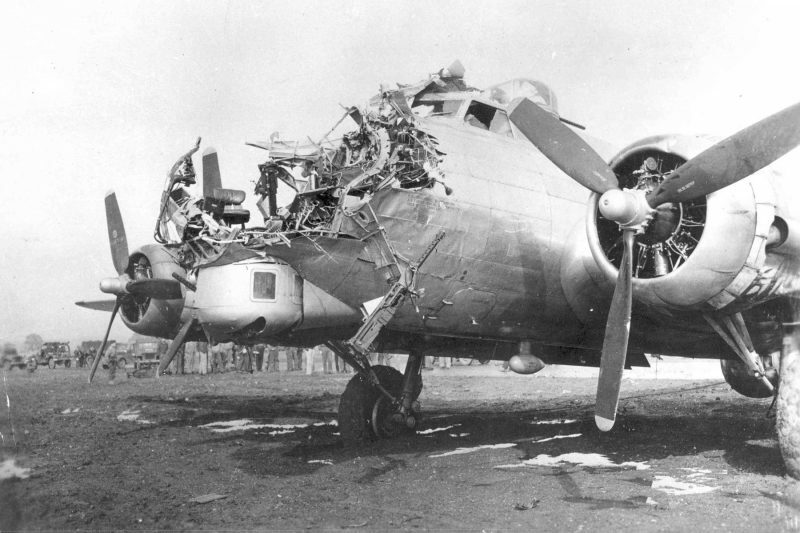 But that is where fate would take a remarkable turn as this B-17 was getting ready to fly into history. For at Port Moresby Airfield in Papa New Guinea, there resided a feisty Captain who led a crew ready for a fight, but not too fond on garrison rules and regulations. Held back by what command deemed to be a lack of discipline, this crew was on the back end of a waiting list for a new B-17 bomber. The plane would require a refitting for sure, but why to stop at just getting this rig up to military standard. While most B-17s came equipped with “only” 13 guns, Captain Zeamer would go on to increase his gun capacity to 19 while simultaneously swapping out .30 cal machine guns with the much larger and powerful .50 cal. But why stop there? They also added a fixed gun position that could be fired from the pilot’s position and even a few extra spare guns where they didn’t even need them. When Zeamer was done, this “cursed” bomber would be the most heavily armed and fortified bomber of the entire Pacific Theatre. Captain Zeamer had his bomber and for a man who worked so hard to get it, he was not about to let it falter when it was needed most. A daring solo mission to photograph the terrain around Bougainville would be needed and Captain Zeamer and his insubordinate crew would volunteer to make it happen. Taking their new personalized and heavily fortified B-17 deep into enemy territory, they were ready to meet the enemy. Or to be specific, 17 of them. Flying over 600 miles of open sea to reach the target, Captain Zeamer and his crew noticed the Japanese fighters taking off. Knowing full well the fight that was getting ready to come their way, they continued the mission and successfully took the photographs necessary to prepare for the upcoming Allied invasion. The Japanese fighters began to encircle Old 666 just outside of a Machine gun range before coming in for the attack. Coming in towards what was normally the lightly armed nose of the B-17, the Japanese Zeros were in for a rude awakening as Captain Zeamer unleashed the newly added forward machine gun taking out at least one Zero. Japanese 20mm canon fire then burst into the cockpit and nose severely wounding Captain Zeamer and 2nd Lieutenant Joseph Sarnoski. Lieutenant Sarnoski was knocked out of the nose by the exploding shell when he noticed more Zeros coming in for the attack. Quickly losing blood, he crawled back to his gun position and took out another enemy fighter before collapsing. Zeamer would suffer extensive shrapnel wounds to his arms and legs, but he continued to maneuver the bomber expertly while his blood pooled around him. The next wave of attack took out the planes oxygen system causing them to descend over 15,000 feet where they could breathe. 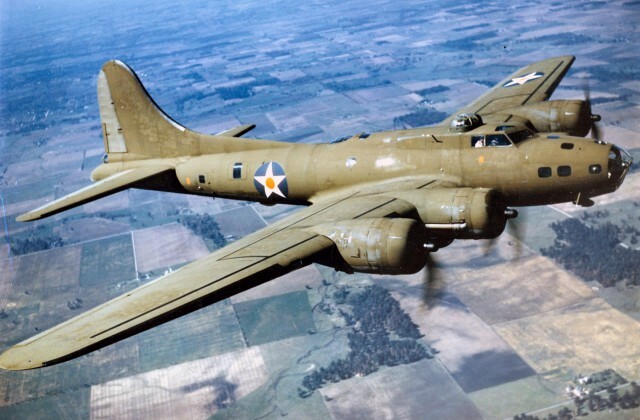 When the plane leveled off, the remaining fighters continued to attack and strafe the B-17 for over 45 minutes. But Old 666 wouldn’t go quietly into the night. They fended off the attack shooting down at least 5 Japanese fighters before they ran out of fuel and had to turn back. Once again, Old 666 would indeed return to base all shot to pieces, but this time it would do so with two new Medal of Honor recipients on board. Six out of the nine-man crew were dead or wounded. When the ground crews saw Captain Zeamer, they declared him dead on the spot. But this Captain had a little fight left in him and would survive. Tragically, 2nd Lieutenant Sarnoski died while manning his guns on the return flight home. Both Zeamer and Sarnoski would be awarded the Medal of Honor for their actions on this solo flight while the rest of the crew earned the Distinguished Service Cross. Old 666 was returned to America in 1944 and eventually met its final end in an Albuquerque scrapyard. We don’t know if all the Japanese pilots survived the war, but if they did we can be confident they speak of the day they attacked a beast and were lucky to live to talk about it. On 16 June 1943, Major Zeamer (then Captain) volunteered as pilot of a bomber on an important photographic mapping mission covering the formidably defended area in the vicinity of Buka, Solomon Islands. While photographing the Buka airdrome. his crew observed about 20 enemy fighters on the field, many of them taking off. Despite the certainty of a dangerous attack by this strong force, Major Zeamer proceeded with his mapping run, even after the enemy attack began. In the ensuing engagement, Major Zeamer sustained gunshot wounds in both arms and legs, one leg being broken. Despite his injuries, he maneuvered the damaged plane so skillfully that his gunners were able to fight off the enemy during a running fight which lasted 40 minutes. 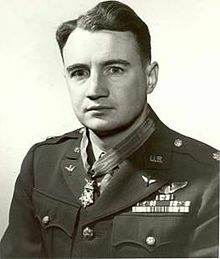 The crew destroyed at least 5 hostile planes, of which Major Zeamer himself shot down one. Although weak from loss of blood, he refused medical aid until the enemy had broken combat. He then turned over the controls, but continued to exercise command despite lapses into unconsciousness, and directed the flight to a base 580 miles away. In this voluntary action, Major Zeamer, with superb skill, resolution, and courage, accomplished a mission of great value.